"The absence of fibrinogen in the plasma leading to pronged bleeding"
It is a rare, genetically inherited blood fibrinogen disorder. In this disease, blood does not clot normally due to lack of fibrinogen. Fibrinogen (coagulation factor I) is a protein which is necessary for coagulation. Afibrinogenemia is an autosomal recessive trait, its meaning that two unaffected parents may have a child have this disorder. So the lack of fibrinogen results uncontrollable bleeding. When a person who gets affected is susceptible to heavy bleeding episodes. Newborns with Afibrinogenemia usually experience heavy bleeding from the umbilical cord stump after birth. Bleeding from the gums and nose bleeding (epistaxis) are common and can occur in any age. Women with congenital Afibrinogenemia can have menorrhagia (abnormally heavy menstrual bleeding). Women with this disorder may have difficulty in a pregnancy. People affected by Afibrinogenemia experiences bleeding into the spaces between joints (hemarthrosis) or the muscles (hematoma). Afibrinogenemia is due to lack of Fibrinogen (coagulation factor I). It is the protein in blood that is required in blood clotting (coagulation). Mutation in one of the fibrinogen genes alpha (FGA), beta (FGB), or gamma (FGG), alters the synthesis of fibrinogen protein. These three genes give instructions for making subunit of the fibrinogen protein. During an injury, fibrinogen is converted to fibrin. Fibrin proteins form a stable network with each unit that make up the blood clot. Mutation results in the absence of fibrin, so blood clots does not occur, leading to the excessive bleeding in the people with Afibrinogenemia. The Genetic Testing Registry (GTR) gives information about the genetic tests for this condition. Partial Thromboplastin Time (PTT) - It is the blood test that measures the total clotting time per cycle. Blood fibrinogen levels > 0.1 g/L and Excessive bleeding test indicates that a person having Afibrinogenemia. Blood clotting is very essential for preventing hemorrhages when you have been cut or bruised. Some dietary changes essential for the body to carry out the process of blood clotting, and you can get these nutrients from eating a balanced diet. Green leafy vegetables are rich in vitamin K. The primary function of vitamin K is as an essential component for blood clotting. A spinach, broccoli, and parsley each provide vitamin K nutrient. Vitamin K also gets from soybean oil. Dairy products help in blood clotting because of their calcium. Calcium is an essential mineral in the coagulation cascade that results in blood clotting. Milk, cheese, and yogurt are rich sources of calcium. Good sources of this mineral, which is important for blood clotting, healing wounds and forming strong bones, you need to the trace mineral manganese. These include tea, seafood, beans, nuts, seeds, whole-wheat bread, tofu and green leafy vegetables. Wild blueberries, coconut, okra also provide significant amounts of manganese as well. Ayurveda is known as "science of Life". Apart from modern science treatment methods, there is one another method formulated by Planet Ayurveda in which the treatment of this particular problem is done by using natural herb and herb extracts. These herbal remedies are formed with no added chemicals and there are no side effects of these herbal remedies. 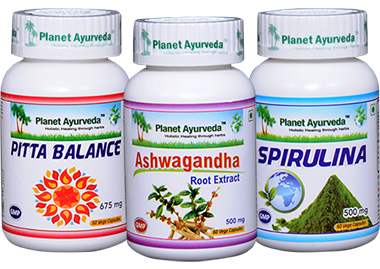 Planet Ayurveda provides the herbal formulation such as Pitta balance, Spirulina, Ashwagandha. The herbs which are used to treat Afibrinogenemia. Pitta in our body is responsible for Metabolism, digestion, and formation of new cells. Pitta balance capsules is an herbal composition which balances the dosha in our body which disturbs the body function. This herbal composition act as a blood purifier and makes the skin healthy and clear. The herbs used in the preparation of Pitta balance are mukta pishti, praval pishit, Jahar mohra pishti akik pishti, kamdudha ras, and giloy satva. Dosage: 1 to 2 Capsule twice daily with plain water after meal. These capsules are prepared from the extract of the 'Arthrospira platensis herb, which has the ability to enhance the overall strength of the body. The herb is known for its excellent antioxidant properties, and it can nourish the tissues of the body. The use of Spirulina capsules can be beneficial for managing blood clotting ability because these capsules can support the healthy immune system, increases the blood clotting factors, cure fatigue and general weakness, promote healthy energy levels, and treat anemia. Spirulina is a good source of lipid. It is a wonderful herb for good health. This herb has adaptogenic & rejuvenative property as it reduces physiological & psychological stress. It helps overall well-being and prevents hair loss. It maintains a healthy immune system, calms the brain. It helps to regenerate new hairs. It has anti-anxiety property and acts as anti-stress. It contains a high concentration of withanolides which show medicinal values. This capsule work in stress, constipation, blood disorders, and has multi-effects.